Rovers away at Millwall in the Championship, 23rd April. I prepared a catch-all Millwall preview for the cup-tie and this game but obviously didnt post the League section of it for the Cup game. So heres a preview relevant to the League game. Millwall was founded in 1885 and, like ourselves in those early years, had a Scottish influence [the club was founded by employees of a canning firm, the head office of which was in Aberdeen] which is one reason for their tradition of blue shirts and white shorts. They were founder-members of the Southern Football League in 1894 and were champions in each of that Leagues first two seasons, finishing second the next season. For some reason, they also played in the Western Football League in the early years of the last Century and were champions in 1908 and 1909.
aftermath of the Hillsborough disaster and was, according to Wikipedia, designed with effective crowd management in mind [given Millwall's crowd problems at the Old Den], with the escape routes being short and direct. known as Division Three [south] the following season [when a parallel expansion in the North and Midlands took place] and were promoted to Division Two when they won their Division in 1927/28. Only the champions of the regional Divisions were promoted in those days, a situation which remained in place until the establishment of Divisions Three and Four in 1958. Millwall remained in Division Two until 1934 when they were relegated back to Division Three [south], where they remained until 1938 when they were promoted to join us in Division Two for the 1938/39 season which we ended being promoted to Division One. when we returned to Division Two in 1975. The Lions followed us back the following season and we met in that Division for three more seasons until we were both relegated in 1979. The two names which immediately spring to mind in this context are Lucas Neill and Steven Reid, both of whom we signed from Millwall. He went on to play for West Ham United and Everton, from where he went on to Galatasaray in Turkey. He then went on to play for two clubs in the United Arab Emirates [Al Jazira, and Al Wasl] before joining Sydney in the A-League earlier this year. Neil and Emerton. The conclusion John drew was, In a nutshell I would say his value is plummeting rapidly. A couple of seasons later, we also signed Reidy from Millwall. He had a fairly short debut for us, being shown a red card 12 minutes after coming on as a substitute for Vratislav Gresko in a game at Bolton in 2003! He scored a cracking goal against Wigan Athletic, which won Goal of the month in December 2005 and his goal in a 1-0 win in our penultimate game of that season at Ewood against Chelsea clinched our place in the following seasons UEFA Cup. ligament injury and missed most of 2008/09 season because of a knee injury. He then went on loan, first to Q.P.R., then to West Bromwich Albion, for whom he signed when they won promotion to the Premier League in 2010. As I dont know any Millwall fans; and, as their equivalent Forums to this Message Board which I visited anonymously seem, erm, how can I put this, a bit assertive, Ive decided to dispense with this section of the Preview [especially in view of how their fans began fighting with each other at the Cup Semi-final]. HOW TO GET THERE AND WHERE TO DRINK [iF YOU MUST]. The Den is served by the South Bermondsey railway station [trains every half hour from London Bridge station], which is a five-minute walk away from the ground. Away supporters have their own walkway link, which is available to them on match days. If unable to travel by train, it's recommended away supporters travel to the ground by official coach. There are no official car parking facilities for supporters. For those fans who live in that part of London, theres also a London bus route [ P 12] between Surrey Quays and Brockley Rise, stopping in Ilderton Road, a couple of minutes walk from the ground. Theres a frequent service from London Bridge to Surrey Quays station. As ever in one of m1st previews, the following guidance on where to drink is extracted from www.footballguide.com Again, Ive highlighted information which seems particularly relevant. There are not many pubs located near to the stadium and those should be avoided by away supporters. If travelling by train then it is probably best to grab a beer around London Bridge before moving onto the ground. I would advise keeping any colours covered, even when drinking in the London Bridge area. There are bars at the back of the stands at the stadium, that serve alcohol as well as some decent food such as chicken and chips. Chris Lynskey a visiting Scunthorpe United fan recommends; 'The Shipwright Arms on Tooley Street, near London Bridge. Come out of London Bridge tube station, turn right and its only 200yds down the road on your right hand side. A lovely little pub which also serves food. We left the pub at 2.15pm to go and catch the train to the stadium and made it comfortably for kick-off'. On the Borough High Street by London Bridge is the Barrow Boy & Banker, which is a Fullers pub and has the benefit of a large screen showing SKY Sports. Further down the High Street is the Borough Market, which on nearby Stoney Street is situated the legendary Market Porter pub. This pub is also a regular listing in the CAMRA Good Beer Guide and always has 9 real ales on tap. Mick Hubbard adds; 'Also on Borough High Street is the George Inn, which is owned and leased by the National Trust. It is an outstandingly beautiful building, and the pub itself retains its wooden flooring and wall panelling. It serves its own George Ale which went down nicely'. What a difference a couple of months can make, particularly in the turbulent world that is Ewood Park. Going into the Cup quarter-final, we were as near to being on a high [Weve seen off the Arsenal; beat these and were in the semi-finals at the new Wembley for the first time!] as weve been since the Walker Trust sold the club. the third bloke this season to have been permanent manager at Ewood was sacked, and Gary Bowyer is looking like he could become the Tony Parkes of the 21st Century. Coincidentally, Huddersfield Town & Watford could have a decisive impact on the futures of both Millwall and us. After losing at Ewood, Huddersfield play Millwall at home this weekend while we visit Watford, who lost at Millwall on Tuesday. Neither teams recent League form has been that brilliant. Weve taken 8 points out of the last 6 games [from the home wins over Derby and Huddersfield as well as the draws at Ewood against Burnley & Blackpool] with away defeats at Cardiff City and Sheffield Wednesday. Millwalls League form [11 points from 18] has been good enough for them to have gone above us in the League. Theyve won 3 games [at home to Watford and away at Charlton Athletic & Leicester City]; lost at home to Sheffield Wednesday and drawn with Ipswich Town [Home] and Birmingham City [Away]. Millwalls recent home League form as above reveals how vulnerable they are at The Den to teams in and around the relegation zone! The match before those mentioned in the "Current Form" section was a defeat at home to Wolves. Writing this before we play at Watford, 6 of the 8 points weve got from the last 6 League games have come from the last two games; does this mean weve turned the corner? well have won exactly half the League games between the two teams. I think that, all in all, this is a really difficult match to call. Two teams in the lower regions of the Championship table and neither could be said to be in the best of form [which is, of course, why were both in the lower regions of the Championship]. Wow these games are coming thick and fast! 4th game versus Millwall this season. 2 losses and a draw has to be a Rovers win by the odd goal. We haven't even scored against them yet this season, although hoofing the ball up to Shittu in both the cup games didn't help. 1-1 draw, although that could change depending on Saturday's result. Despite having players back from suspension and injury, the players havenot got the pride to go an sneak a win. This game will require heart, bravery and defiance and a will to win. 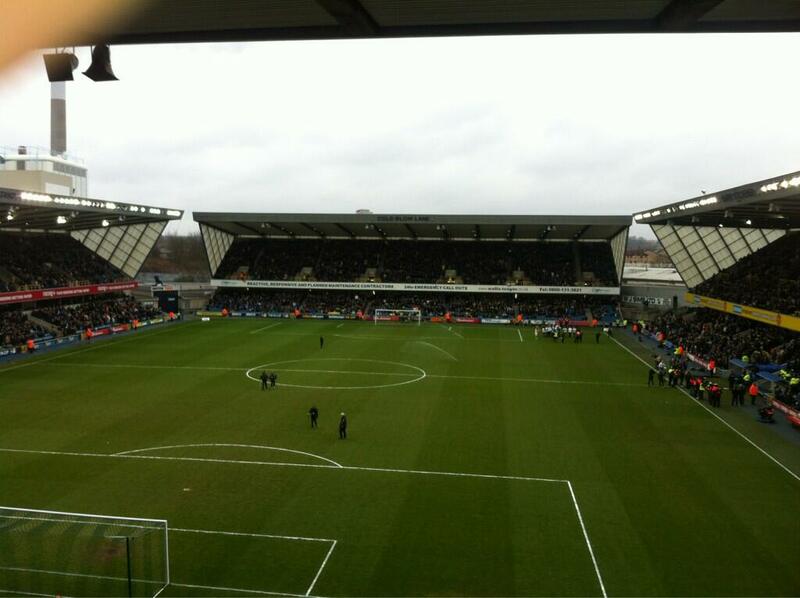 3 points are needed desperately and Millwall will be hurting after their thumping at Huddersfield. 6-0 overpaid gutless and spineless. At least you can count each goal on one hand. Not if one is inserted into my bottom. Oh, please, stop you talking out of it! Does anyone know if tickets will be available on the night? This is now a bonafide must win. I really fear for us. 2-0 Millwall evening up the goal diff. with Posh. Good luck to all who go and watch this group of players in Rovers colours thinking about who they will be playing for next season whilst saving themselves for next season and their new employers. Another massive game and I just hope that the players really try to get something from this game. One point would be good and we have to win the midfield to get something from this game. The return of hanley and CKR are important, specially to allow some alternative line ups for Bowyer. CKR could close in the right side when we defend and support Rhodes when we attack. hope lowe is back for this one, as despite the derision directed his way i believe we miss his energy in the middle when he`s not playing(as against watford imo where dunn was certainly not a suitable replacement). as i`ve said previously, all these remaining games are now a desparate scrap for points, and all we can hope for is a bit of luck in terms of bounce of the ball/ref decisions and that the players show that bit of extra quality than our opponants. It's on BBC Radio 5 Live Extra for those that can't make it and enjoy torture. After Givet's horror show at the weekend we desperately need Hanley back in there. I'd possibly for Lowe as well, Dunn might be more effective from the bench so soon after the game on Saturday. Excellent preview. Thanks yet again m1st, you have worked hard all year! After Saturdays capitulation who knows what will happen and to expect? Suspect more of the same. 2.0 Millwall and a frightening run in. Lowe needs to play, if fit. Don't care if he's pants on the ball, he's one of the few players we've got who covers ground and wears the badge with pride. But he doesnt do anything positive for the team. Hes pants off the ball aswell as on it. He was one of the PL's most successful tacklers last season.